Seaham RFC (red) v Richmondshire RFC (hoops) at Seaham park, on Saturday. Chris Geehan was recalled to provide front row cover, Arron Stevenson provided utility cover, Price replaced Harry Connell in the backs and Luke Victory returned to start as lock in place of rookie Jamie Gair, who unfortunately went on to break his leg while representing Sunderland’s second XV against Gateshead at Ashbrooke. That game was abandoned as a result. 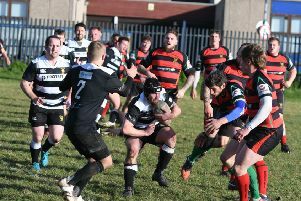 The attraction of a beer festival and a decent game of rugby saw a good crowd bask in glorious sunshine and take in a competitive match that saw both sides cancel each other out in the opening exchanges. With a strong wind behind them Sunderland, when awarded long-range penalties, looked to punish Sedgefield and take early points, but kicks from Leon Ryan drifted wide of the mark. He would, however, go on to kick 12 points over the course of the game. The scores opened on 20 minutes as fly half Marc Edmundson created and exploited space, weaving in under the posts, presenting Ryan with an easy conversion. Flanker Grant Edmundson shook off a dead leg to sprint in from halfway line to score under posts as Sunderland disrupted a Sedgefield scrum and Edmundson reacting quickest to gather the loose ball, the conversion giving Sunderland a 14-0 lead. Sunderland created chances and overlaps out wide and better distribution could have reaped more reward. Penalties from Ryan on 30 and 36 minutes saw Sunderland end the half 20-0 up. Within two minutes of the restart, Ben Hutchinson released Price to outstrip his opposite number and score out wide, the conversion slotted by Ryan. Sedgefield’s defence was resolute and they came back into game with converted try on 59 minutes. Sunderland’s penalty count at the breakdown was starting to mount and the referee had words with Pete Harrison to restore order as Chris Geehan was off side, off his feet, and smothering ball in the ruck. Kie Hanlon ran a hard line from inside Sunderland’s 22, releasing some sustained Sedgefield pressure. The ball was passed out to Price who drew his man, offloaded out of the tackle to Dean Edmundson who drew Sedgefield’s defenders. He then popped a pass back inside to Price who had sprinted a good 20 yards after being tackled to take the return pass then gas the full back on the outside to score. The conversion attempt rebounded back from the crossbar. Jack Hope saw yellow as the referee’s patience ran out for repeated offences at the breakdown. Sedgefield gathered momentum and added two more scores, putting ball through hands to find gaps in Sunderland’s stretched defence bringing scores to 32-19 in Sunderland’s favour. Patience was rewarded as Sunderland regained possession to play phases and put Price in space, but with still a lot to do, broke tackles then outstripped Sedgefield for pace to score on 79 minutes, the conversion from Ryan bringing Sunderland their long-awaited Sedgefield away victory.